Giesen release several editions of New Zealand's leading Sauvignon Blanc each year. The Brothers is a fine assemblage of fruit from four vineyards at Rapaura, Mathews Lane and Dillon's Point. The Rapaura blocks show intense capsicum and pungent box tree aromas, contributing a juicy weight to the palate. The balance of parcels bring intense lifted citrus and nettle perfumes while adding superb linear structure. 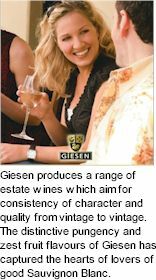 It's the vital, refreshing qualities and impeccably clean finish which make Giesen wines so appealing to palates throughout the world. Theo, Alex and Marcel Giesen remain very involved in the winemaking, working closely with the growers amongst the vines. Low yielding, cool climate sites are what makes Giesen's wines so unique. Complex fruit aromas make them enjoyable whilst young, refreshing acidity gives the wines backbone for development whilst still in the bottle. The Brothers is a very special wine, the finest parcels of Sauvignon Blanc are set aside and only premium free run juices are included, inoculated with select yeasts for fermentation over three weeks at 12C to 15C. Most of the components remain on yeast lees for several months before assemblage and filtration, adding even more dimensions to the aroma and depth to the palate. Pale yellow hues. The bouquet is lifted, ripe and pure, a lovely display of capsicum and slightly off, clean pungent box tree aroma combined with aromas in the greener spectrum of citrus, nettles and dry cut grass. The palate has considerable power and weight of juicy fruit, succulent with an elegant structure leading to a finish with loads of clarity and purity.